Springer Nature and the Knowledge Media Institute (KMi) of The Open University are partnering to provide a comprehensive Computer Science Ontology (CSO) to a broad range of communities engaged with scholarly data. CSO can be accessed free of charge through the CSO Portal, a web application that enables users to download, explore, and provide feedback on the ontology. Ontologies of research areas are important tools for characterizing, exploring, and analyzing a research landscape. This CSO contains information about 14,000 research topics and was automatically generated by means of the specialized data mining technologies developed by the SKM3 team at the Knowledge Media Institute. This resource presents several advantages over alternative taxonomies: it is produced entirely automatically and therefore can be regularly updated with little effort; it is generated from a very large corpus of publications in computer science; and it provides a fine-grained characterization of this field of study. Indeed, this CSO is about an order of magnitude larger than other current characterizations of this field. The CSO currently supports a variety of tools and research prototypes for classifying and recommending research publications, making sense of research dynamics, modelling the evolution of research communities, and forecasting research trends. Springer Nature is a leading research, educational and professional publisher, providing quality content to our communities through a range of innovative platforms, products and services. Every day, around the globe, our imprints, books, journals and resources reach millions of people – helping researchers, students, teachers and professionals to discover, learn and achieve more. Through our family of brands, we aim to serve and support the research, education and professional communities by putting them at the heart of all we do, delivering the highest possible standards in content and technology, and helping shape the future of publishing for their benefit and for society overall. Visit: springernature.com/group and follow @SpringerNature. The Knowledge Media Institute (KMi) of The Open University is a multidisciplinary R&D lab that has been at the forefront of innovation for the past 20 years, leading in a number of areas, including Semantic Technologies, Educational Media, Social Media Analysis, Big Data, Smart Cities, IoT and others. The Open University (OU) is the largest academic institution in the UK and a world leader in flexible distance learning. Since it began in 1969, the OU has taught more than 2 million students worldwide and has over 170,000 current students, including more than 15,000 overseas. 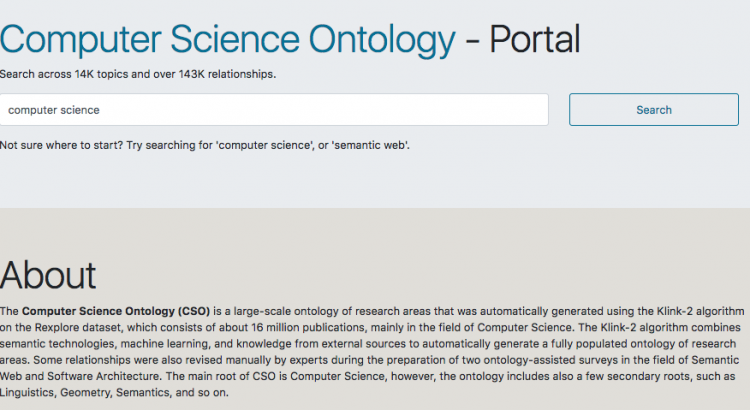 The new ontology portal, in partnership with @OpenUniversity, is the largest taxonomy of research topics in computer science available to date.